A book everyone should read is The Law by Frederic Bastiat. Written in 1849, this short work is dead-on at identifying both the purpose and the limitations of government and legal systems. Highly recommended! The Law is freely available from multiple sources and in multiple formats, including this e-book site: http://www.feedbooks.com/book/2770/the-law. Although I was not enthusiastic about the prospect, I recently had a chance to read Going Rogue: An American Life by Sarah Palin. It’s really not bad and I think it conveys a substantial amount of what her former running mate might call the "straight talk” about who Sarah Palin is and what she really stands for. Which is what exactly? some of you might be asking. The great irony of Going Rogue is that it delivers very little new information. Instead Palin (with a little help from her ghost writer) tells her story in plain, faintly colloquial language in a rather obvious attempt to set the record straight, as she sees it. Like Sarah Palin or not, it must be recognized that she was targeted in the press during the 2008 elections. Going Rogue is an attempt to redress those legitimate grievances. Half the book deals with her life prior to John McCain’s surprise selection of her as his VP nominee and it’s an interesting tale of a hard-working woman who worked hard, served her family and her constituents, and achieved success after success on the local and state levels. There’s no question that Alaskans were better off with Palin as governor than with her predecessors. Democrats’ attempts to dig up dirt on Palin have all but failed and her book, if it’s to be believed, makes it clear that no such attempts will succeed in the future. Sadly Going Rogue was released a year too late for the American people to use it as a decision-making tool in the 2008 elections. Would it have made a difference? I doubt it. The book is short on details – Palin doesn’t always name names, a fact that shortchanges the reader’s interest in exposing corruption in Alaskan politics – and her message, that of personal responsibility and limited government, while well articulated in places, falters during her account of the McCain campaign. The second half of the book deals with those 10 weeks during which Sarah Palin injected an adrenaline shot into a veritable corpse of a campaign, energizing disheartened Republicans and scaring the radical left so badly that their wrathful, hateful response was inevitable and vicious. This section of the book, as has been mentioned by other reviewers, is what gives me pause about a future Palin presidency. As the VP nominee she should have been sufficiently courageous to tell McCain staffers who were muddying her message and hobbling her efforts to drag the dead horse of their campaign uphill to get the hell out of the way. Instead, and in her own words, Palin was stymied by the bureaucracy and infighting of McCain’s advisers to the point that she was largely ineffectual after her initial boost to his campaign. If she couldn’t put these hired flunkies in their place or truly do what some have accused her of – go rogue – what confidence is that supposed to inspire in me as a voter that she’ll be able to do better with more responsibility and a more contentious set of opponents/enemies? As a leader there has to come a point when you recognize that your side’s efforts are failing and something more, a political Hail Mary, if you will, is needed. Palin’s selection was one such miracle for John McCain, but he needed another, a true maverick that wouldn’t allow his spin-masters to squander what little chance Republicans had to win the election. Obviously that did not happen and some of the blame must go to Sarah Palin for allowing McCain’s people to stifle her. Bottom line? Going Rogue tells us who Sarah Palin is, a good person, a patriotic American, and a loyal public servant. It also tells us that in 2008 she wasn’t presidential material. In fairness, she wasn’t running for president, any more than Joe Biden was. But she was judged by that standard and found wanting. Did Katie Couric do a hatchet job on her as Sarah Palin claims? Others in the press certainly did. But it’s the Couric interview that stopped the McCain machine dead in its tracks. Personally I believe that Palin botched that interview by attempting to be overly deferential to the McCain campaign HQ. Not able to answer freely, she bumbled and fumbled and all but blew the Republicans’ long shot at winning. Perhaps if she’d simply had the fortitude to stand up for her own beliefs and answer directly, the outcome would have been different. That’s the lesson I think Sarah Palin needs to learn – to truly be herself, regardless of the consequences. After all, what was the worst that McCain could do? Drop her from the ticket? No. Banish her to the political equivalent of Outer Mongolia if he won? Hah! She was running for VP – she would have been halfway there anyway. My final conclusion is that we’ve heard and read almost everything in Going Rogue before. Only the perspective is different here and it rings true for the most part (Palin’s take on the Couric interview being the only dissonance), even when the truth that’s revealed is that she needs to get stronger if she’s going to be president someday. I’ll cut to the chase so the disinterested can cut and run without wasting their time: Wild at Heart is a book, perhaps the book, for Christian men who sense that something is missing from their lives, their relationships with their wives and children, their church, and/or their relationship with God. Now, be honest: Do any of those ring true for you? If so, I recommend this book wholeheartedly. I read it in one day – stayed up until 5 AM finishing it – it’s that intense. 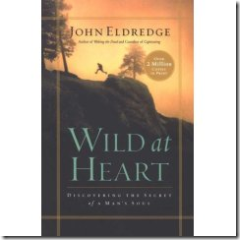 But Wild at Heart is not just for men – a couple of friends’ wives really liked the book too. I can see it being a very interesting lense for a woman to see her husband through. Owing to men’s amazing powers of self-deception it shouldn’t be a surprise that the women in our lives often see us more clearly that we do ourselves. So what’s the deal? Eldredge says that men need adventure in their lives. We’re born to seek out challenges and take them on, just because they are there. Yet modern western live is explicitly designed to eliminate the very thing that drives us and makes us love life. Extreme stock trading? Adventures in restaurant management? Give me a break. The business world – where most American men live and die – requires a man to be efficient and punctual. Corporate policies and procedures are designed with one aim – to harness a man to the plow and make him produce. But the soul refuses to be harnessed; it knows nothing of Day Timers and deadlines and P&L statements. The soul longs for passion, for freedom, for life. Can a man live all his days to keep his fingernails clean? This that what a boy dreams of? Of course not. In my line of work, the business of software consulting and development, the height of achievement is a “repeatable process”. Once the gurus figure out how to solve a problem we codify the way and follow it almost religiously. Doing so makes money and cuts down on project delivery times, sure, but hardly makes for inspiring work. Eldredge answers the question, “Where have all the real men gone?”, early in the book. The answer, not surprisingly, is that they haven’t gone anywhere – they’ve just been neutered and suppressed by society, remade in the image, in many ways, of the women for whom we tone down our wilder, more interesting side. He takes on the Christian church in the same vein, saying its interest is in taming and pacifying men with the inevitable result: most men find nothing of interest in church and leave it in the flesh or in the spirit. Question: What is the value in attending service once a week if that’s the extent of our relationship with Christ, our brothers there, and our community? Zip. So why bother? But that’s what most of us do, in part because the church has failed to inspire in us the amazing story of our heritage. What matters is what we do when we leave the church. Service is like recharging one’s batteries. But to make that worthwhile we have to use to power inside us. Unlike that of the often tepid church, Eldredge’s Jesus is bold, courageous, and lives the greatest adventure ever recorded, challenging the authorities of his time and the devil himself. And Eldredge’s God is not an fickle puppet master pulling this string or that but a Creator who has taken the greatest risk of all by turning all of us loose into the drama we’re playing out now. Think about it. What else is there that’s worth doing? As Eldredge notes, these three must-haves are hard-wired into virtually every male on the planet. That includes your dad, your boss, and even your pastor, whether they acknowledge these fundamental needs or not. The trick, Eldredge says, is to recognize that your heart is crying out for the essential things in life and these are them. Your iPhone, HD DirectTV and plasma TV are worthless – forget them. Everything you need is either inside you, available through God (who wants to get inside you), or there waiting for you to see its real value. There’s something wild in the heart of every man, he says, and you can’t escape it forever. Working late to getting that extra report done in time for your boss to pass up to his boss and so on is not an adventure. Sorry to be the one to tell you, but someone had to. Don’t mistake me, the book is not a sermon, a lecture, or a how-to guide – it’s the story of a journey that we can all make if we dare. Eldredge blends in personal anecdotes, stories about men he’s met and counseled over the years, literary and film references, all to create a free-flowing narrative that reads easily, even through the difficult sections. The movies a man likes are very telling, Eldredge says, and that it’s small wonder that films live Brave Heart and Gladiator are favorites among men. Is there any doubt that most of us long to be heroes? Who dreams of growing up to be a financial analyst? Or an associate managing paper pusher? Please. Yet many men – most, in my reckoning – force ourselves to aspire to these careers of doom because doing so is a safe bet, a sure way to make money and acquire the things we think we need. We sell our time and our hearts in an attempt to get happiness, in other words. But that fails, of course, because “cog in the machine” careers provide no inspiration and we’re left empty by the lack of it. The result? Road rage, lost tempers, broken relationships, escapism, illicit affairs, lost weekends in front of sports TV. We’ll do anything to break out of the artificial mold of a misspent life. Anything, that is, except change. According to Eldredge, the all-important question that a man asks himself, if only subconsciously, is this: Do I have what it takes? A man who grows up without battles and adventures often doesn’t know how to answer that question, if he even has the self-awareness to ask it. Yet the lack of an answer manifests itself in his life and in his behaviors: lack of self-control, poor discipline, workaholic behavior, drinking and drugs. And the list goes on. Why does this happen? Too often, Eldredge says, boys’ fathers are at fault for not showing a young boy the way, for failing to help him answer that one crucial question: Can I do it? Worse yet, fathers often “prove” to a boy that he can’t by saying or doing exactly the wrong thing at the wrong time. To make this point, Eldredge relates a series of tales that could literally break your heart if you’re one of those men or friends with someone who is. Eldredge gets in a nice shot at our enfeebled school system, which he says is 3-4 times as likely to treat boys for hyperactivity than girls. Perhaps, he says, boys simply are not designed to sit in a classroom for 8 hours every day. We need more than that. But schools insist on trying to change boys rather than change the way they teach. Small wonder, given that the overwhelming majority of teachers are women. He also discusses the role of the church in a young man’s life. There above all places should a boy learn to be a man. Not merely a nice boy or a legalistic follower of a moral code, but a man who embodies everything that Christ was and will be again. The purpose of church, Eldredge says, is not for men to become moral, it’s for them to become Christ-like, men in obedience to God and who are not afraid to fight for what is right. Arguably, Christian churches seem to fail miserably at this most of the time. Adrift, too many boys become flawed men. Often they are insecure in themselves and have problems relating to others, both men and women, honestly. With men this insecurity is often expressed in terms of self-aggrandizement or destructive subordination, with women they are often promiscuous or physically abusive. None of these relationships can ever fulfill a man because they are built on lies that must be maintained. The solution, Eldgredge says, is for men to recognize that we are incomplete, that a real, honest relationship with God can supply what’s missing, and that nothing that’s passive or formulaic will do. That means the fake Christian who shows up and follows the church rules by the book has to go and the real man must step up and go to bat for himself. Eldredge’s own story is familiar. Cut off from a disinterested father, he was left to teach himself how to be a man. He grew up driven, was successful in his career but always felt like the world expected more of him than he had to offer, that he was only pretending to be the man that people took him for. And how did he overcome these feelings of inadequacy? Largely, he says, through the honest company of other real men and through communion with the Father. I would say that it’s time to forgive our fathers for their failings, even as we acknowledge that we may fail our own in children in many of the same ways. Yet our ultimate Father can heal us, regardless of the damage we may incur along the path of life, someday, when we’re ready to leave all of our baggage, pride and hurt alike, behind. It’s only then that such a can relationship form. But Eldredge’s definition of a relationship with God is not one of dependence. We can count on God, true, but as men we still have many battles to fight on our own, battles against other men, against our own tendencies to deny responsibility, evade conflict, and blame others, against our demons and others’, and against the temptations of life. These battles are critical for us to face. Running away from them diminishes our strength; instead, we need to fight and win on our own terms to reach our potential. Giving up, quitting, falling for the artificial victories promised by our world, all of these things destroy the men that we could become. Eldredge also discusses spiritual warfare at some length. It’s quite real to him and he says that not every thought that appears in our minds comes from ourselves. From where then? And to where? What is the most important relationship in the world if not that between a husband and wife? Satan’s favorite target, in other words, is your marriage. Protect it, at all costs. This is the greatest battle a man has to fight. Win it. Eldredge says it won’t be easy, particularly when and if you commit yourself to follow Christ more completely. The Enemy doesn’t bother with people who aren’t following God. But do so and you can expect problems to come up in your life. It’s natural to be afraid in those situations. But remember God is with you and take courage, like Joshua did in Moses’ absence. Near the end of the book Eldredge relates a moving episode in his marriage that many of us can identify with. Someone else’s happiness makes our own lives and marriages seem less desirable. Then a fight with our wife makes us doubt the whole thing, the years of marriage, the sacrifices we’ve made, all of it. How do you respond in a situation like that? Alone, it’s perhaps the most difficult battle of all to fight. Alone, Eldredge might have failed and lost his life as a result. Are you alone in those situations? A man’s most valuable relationship on earth is with his wife. You owe it to her to be the best man you can be – honest, upright, and true to yourself. True to her too, because she deserves and needs your strength and love. Praise her. Trust her. Love her. The word is a verb, not a feeling, so do it. To Eldredge, men and women are opposite sides of God’s likeness, made for each other but not like each other. It’s a lesson worth taking to heart. I want to live my whole life like that. I want to love with much more abandon and stop waiting for others to love me first. I want to hurl myself into a creative work worthy of God. I want to charge the fields at Banockburn, follow Peter as he followed Christ out onto the sea, pray from my true heart’s desire. Life is not a problem to be solved; it is an adventure to be lived. That’s the nature of it and has been since the beginning when God set the dangerous stage for this high-stakes drama and called the whole wild enterprise good. He rigged the world in such a way that it only works when we embrace risk as the theme of our lives, which is to say, when we live by faith. Most men spend the energy of their lives trying to eliminate risk, or squeezing it down to a more manageable size. Their children hear ‘”no” far more often than they hear “yes”, their employees feel chained up and their wives are equally bound. If it works, if a man succeeds in securing his life against all risk, he”ll wind up in a cocoon of self-protection and wonder all the while why he’s suffocating. If it doesn’t work he curses God, redoubles his efforts and his blood pressure. When you look at the structure of the false self men tend to create, it always revolves around two themes: seizing upon some sort of competence and rejecting anything that cannot be controlled. Does that sound like you? Personally I see myself in those words. Let it and this book can rock the foundations of your life. Important: Understand that there is a difference between taking a risk and being a fool. How do you know the difference? It’s not always easy to tell, is it? Taking a leap of faith requires having faith in something, doesn’t it? If you had permission to do what you really wanted to do, what would you do? Don’t ask how, that will cut off your desire at the knees. How is never the right question; how is a faithless question. It means “unless I can see my way clearly I won’t believe it, won’t venture forth.” When the angel told Zechariah that his ancient wife would bear him a son named John, Zechariah asked how and was struck dumb for it. How is God’s department. His is asking what. What is written in your heart? What makes you come alive? If you could do what you’ve always wanted to do, what would it be? You see, a man’s calling is written on his true heart and he discovers it when he enters the frontier of his deep desires. To paraphrase Baiie, don’t ask yourself what the world needs, ask yourself what makes you come alive because what the world needs is men who have come alive. Strength and creativity are essential to personhood and to masculine strength. The adventure begins and our real strength is released when we no longer rely on formulas. The only way to live in this adventure – with all its danger and unpredictability and immensely high states – is in an ongoing, intimate relationship with God. The control we long for is an illusion. Far better to give it up in exchange for God’s offer of companionship, set aside stale formulas so that we might enter into an informal friendship. Sometimes the winds howl around me; other times I fear I’ll fall. The other day I was feeling way out on the end of my rope, cutting a path across a sheer face of risk. Out of my heart rose a question. What are we doing, God? Is any of this resonating with you? If so I would recommend setting aside 6 hours of your life to make what might be the most important investment you’ll ever make in yourself.